Dr. Kermit Gosnell  a “barbaric” “monster”  is on trial in Philadelphia for murdering one woman and seven babies. The major TV networks and big-city newspapers want America to know nothing about it, so they are ignoring the story: a deliberate conspiracy of silence, demonstrating their intellectual and moral depravity. A doctor whose abortion clinic was a filthy, foul-smelling “house of horrors” that was overlooked by regulators for years was charged Wednesday [Jan. 19, 2011] with murder, accused of delivering seven babies alive and then using scissors to kill them. 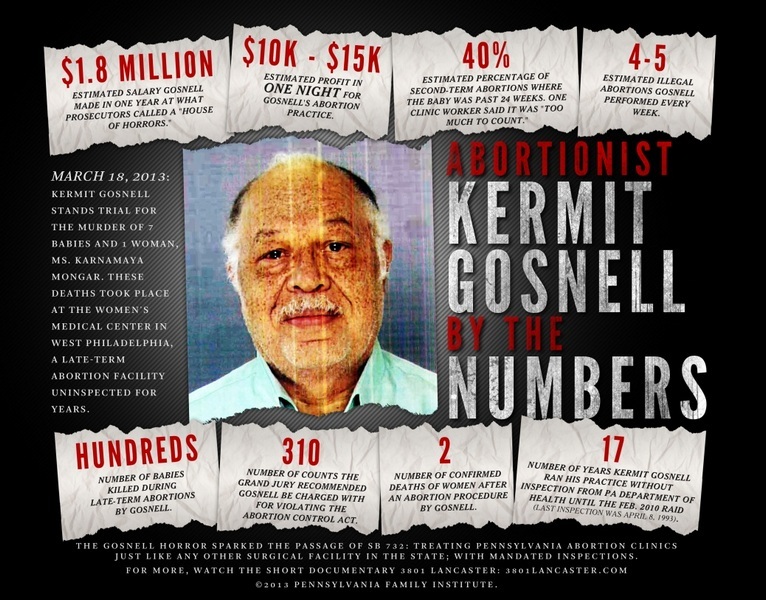 Hundreds of other babies likely died in the squalid clinic that Dr. Kermit Gosnell ran from 1979 to 2010, Philadelphia District Attorney Seth Williams said at a news conference. 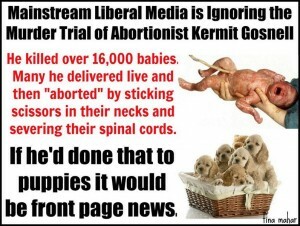 “My comprehension of the English language can’t adequately describe the barbaric nature of Dr. Gosnell,” he added. “I think it’s quite clear that, if these allegations are true, we’ve had a monster living in our midst,” Nutter said Friday [Jan. 21, 2011]. Pennsylvania Family Institute has a timeline and trial updates  which you’ll have trouble finding anywhere else. A “tweetfest” is being called for tomorrow, Friday, April 12th. 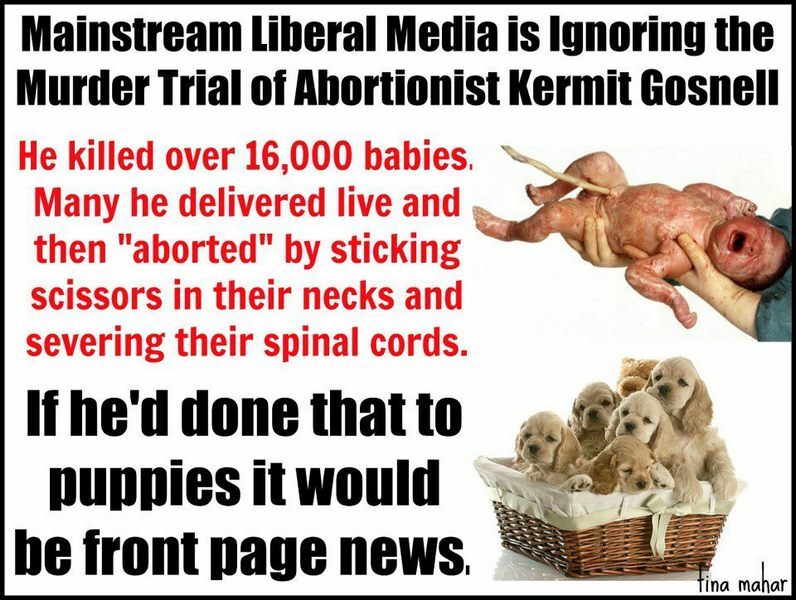 Call out media using the hashtag “#gosnell”. Not on Twitter? Call or email media and demand they cover the trial of Philadelphia’s “barbaric” “monster” doctor. Previous ArticleWhy is There a Crisis in the Confessional? Next Article The Terrible Teenage Years? Thank you for sharing. This is horrendous and we must spread the word on mainstream media! The media is an extension of the democrat party. Democrats support abortion. Why would the democrat media report negatively what they support? I disagree with Mr. Core’s statement that – You don’t have to oppose abortion rights to find late-term abortion abhorrent. The fact is that it’s all abhorrent and the dems. know it so they don’t want to take any chances. Mum is the word and Mom is the target. There has been a massive response to posting this horror story on Twitter. It’s out there far and wide and now we will see how the media will response to this real ‘war on women’ and their unborn babies. Women I work with who have had abortions are now faced with the anguish of wondering what happened when they aborted – and be sure that there are more Gosnell’s out there – George Tiller was a media hero despite the fact that he specialized in late term abortions, partially delivering live babies and just before they fully emerged, he would kill them – and we call ourselves a civilized country!